Please add $24.50 for shipping, handling, and insurance. Comes in a large gold frame with offwhite mat. Ethreal excitement abounds in this beautiful art that leads hearts to worship in this contemporary interpretation of Revelation 7:12. "Angels were standing around the throne and worshipping God. They said, Amen! Blessings and Glory and Wisdom and Thanksgiving and Honor and Power and Strength belong to our God forever and ever Amen!" Angels Were Standing copyright© 2006 by C. Michael Dudash is prohibited from being copied. All applicable copyright© laws apply and are reserved by C. Michael Dudash. Web pages copyright© 1998-2006 by Christ-Centered Art. All Rights Reserved. 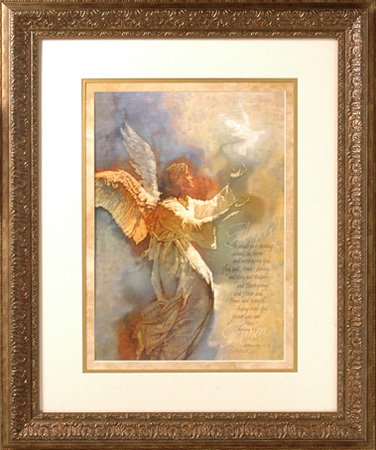 C. Michael Dudash art, angelic beings, angels, biblical, religious, spiritual, artwork, art work, canvases, images, paintings, pictures, and prints of C. Michael Dudash by artist C. Michael Dudash for sale. 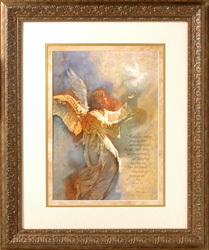 Angels Were Standing painting by artist C. Michael Dudash can be purchased in art print or canvas form at special sale prices at Christ-Centered Art.